In a large saucepan, cook sweet potatoes and carrots until tender; drain. Cool slightly; place in a blender or food processor. Add orange juice, honey, butter, garlic, salt and cinnamon; cover and process until smooth. Pour into a greased 2-1/2-qt. baking dish. 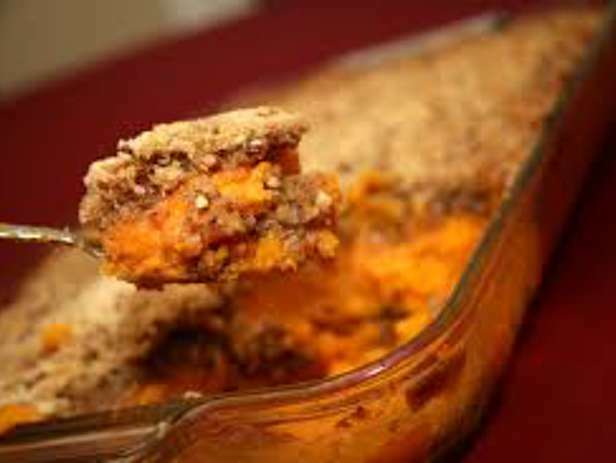 Combine topping ingredients; sprinkle over sweet potato mixture. Cover and bake at 350 degrees F for 30 minutes. Uncover, bake 15-20 minutes longer or until heated through.